Arizona, a solidly ‘red’ (Republican) American state, is enacting policies to attract more Mexican visitors. This contrasts sharply with the promise of presidential candidate Donald Trump to build a high, sturdy wall along the US-Mexico border. Arizonan movers and shakers have started to think that bringing in more Mexicans is a good way to stimulate growth. 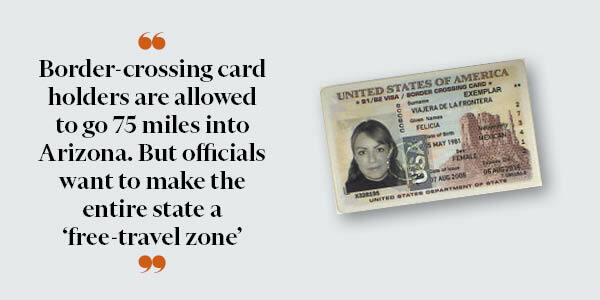 To make people from south of the border feel more welcome, county planning organisations, municipal officials and business leaders are lining up behind a proposal to transform their entire state into a “free-travel zone” for millions of better-off Mexicans with the money and wherewithal to qualify for a travel document that is widely used in the south-west, but little known elsewhere — a border-crossing card, or BCC. …. BCC holders are currently allowed to go 75 miles into Arizona, which takes them as far as Tucson, the state’s second-largest city. But Arizona officials are seeking a change in federal rules that would allow these people to roam across the [entire] state, hoping that if the visitors travel further, they will stay longer and spend more money at malls, restaurants and tourist attractions. The desired Mexicans are a far cry from the “murderers” and “rapists” of Mr Trump’s stump speeches. They can afford the $160 fee and offer the proof of employment and family ties back home that are required for a BCC, which is good for 10 years and enables Mexicans to remain in the US for up to 30 days at a time. To stay longer or travel further, they need more documentation. Gary Silverman, “US-Mexico border: Arizona’s open door“, The Big Read, Financial Times, 18 December 2015 (metered paywall). This entry was posted on Sunday, December 20th, 2015 at 04:06	and is filed under Urban and Regional Economics. You can follow any responses to this entry through the RSS 2.0 feed. Both comments and pings are currently closed. It sounds like a smart move to bring in more money to the AZ economy. It’s hard to believe that a lot of our leaders, who are staunch, racist Republicans, would support the idea.